Confucius was the most highly regarded teacher, moralist, and poet in Chinese history. 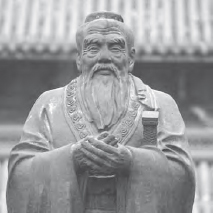 Mencius (372–289 B.C.E. ), the most prominent Confucian philosopher after Confucius himself, held that all human beings are born with moral inclinations. Mencius’ teachings have persisted as the dominant form of Confucianism to the present time. Hsun Tzu (c. 312–230 B.C.E.) taught Confucianism as a way of following formal hierarchical social structures to achieve personal happiness. For additional information on the teachings and history of Confucianism refer to: Xinzhong Yao and Hsin-chung Yao, An Introduction to Confusianism (2000), and Chung-Ying Cheng, New Dimensions of Confucian and Neo-Confucian Philosophy (1991). A statue of Confucius at the Confucious Temple in Suzhou, China (iStock).